Billy Arnold was extended to the final bell for the first time in his pro career on this day in 1944. 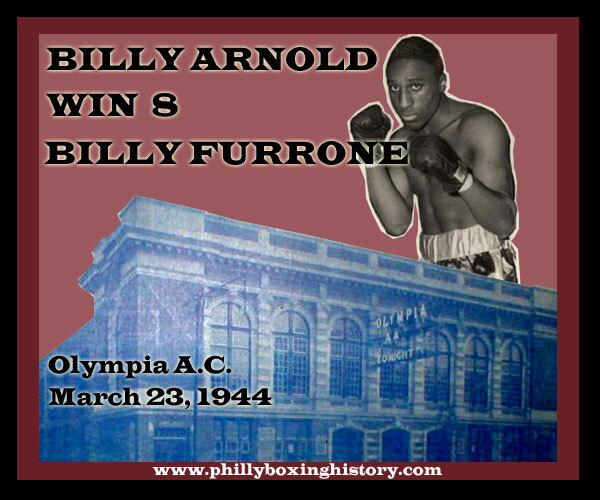 The South Philly slugger faced tough Billy Furrone at the legendary Olympia Athletic Club and plastered him with a tremendous hail of heavy punches. The pounding continued round after round. Furrone was on the brink of being stopped a number of times as Billy "The Kid" gunned for his 17th consecutive kayo. When the bell sounded at the end of the 8th round, it signaled both the end of the bout and Arnold's streak. Two months later at Philadelphia's Convention Hall, they were at it again, and once more Arnold had to settle for a decision (W6). 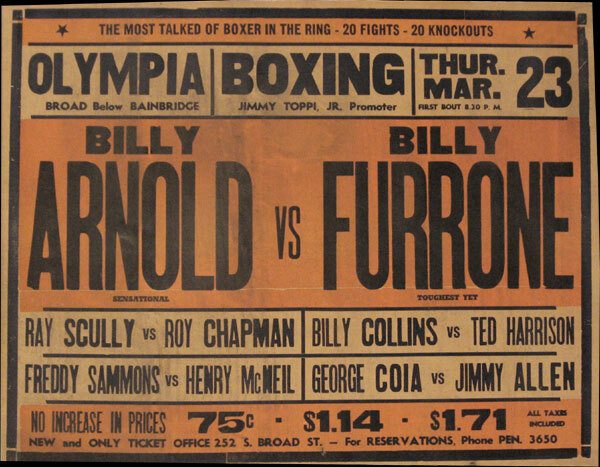 Furrone was so tough that he proved to be the only man to extend Arnold in his first 29 fights - and he did it twice. Teenage sensation, Billy Arnold, also known as the "New Joe Louis", posted an overall record of 42-9-1 with 35 KOs.